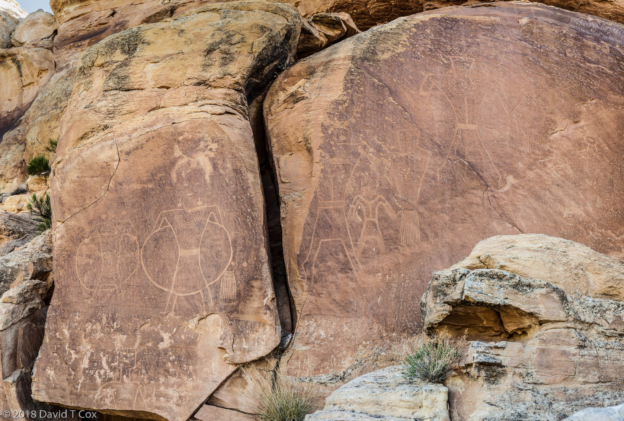 From Dolores Colorado I headed north to Green River Utah, where I have been a number of times to visit the Barrier Canyon rock art which many consider the best pictographs in North America. These include many eerie life-size paintings, mostly in red and white, of human figures, generally without limbs as if in death shrouds. Age estimates vary from 2,000 to 5,000 years ago, with most agreeing they date to the Archaic and pre-date the Basketmaker and Fremont petroglyphs. 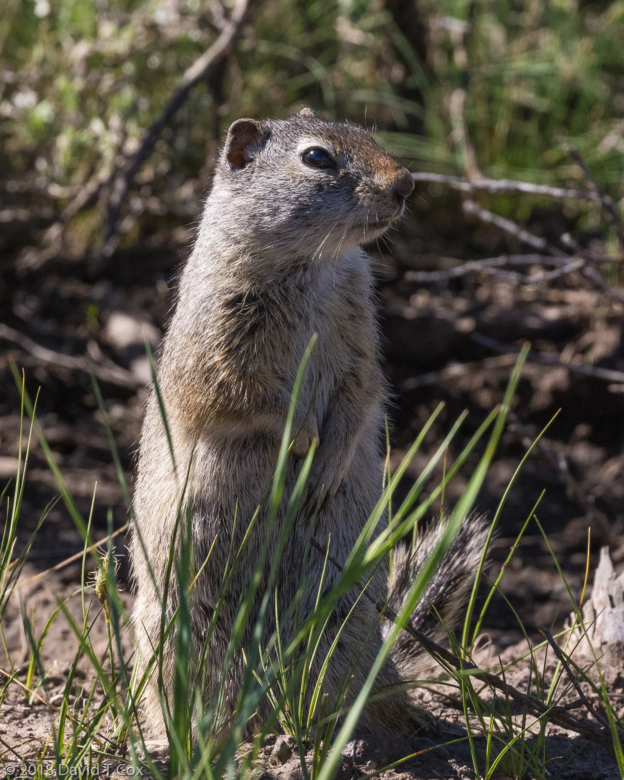 They are found in a number of sheer sandstone cliff alcoves throughout central Utah. The very best, for which all are named, lie deep in what was originally known as Barrier Canyon, now renamed the Horseshoe Canyon and made a dis-contiguous part of Canyonlands National Park. 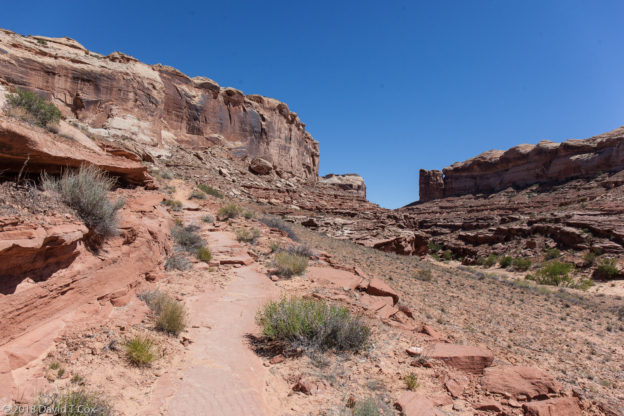 To visit one must drive to the remote part of central Utah, the final drive being 40 miles of dirt road to the trail head at the top of Horseshoe Canyon, all primitive area. A rocky trail descends 800 feet into the canyon bottom where one hikes the sandy streambed several miles upstream through the towering sandstone cliffs. The views are breath-taking even as the slog through the soft sand with camera gear leaves one muttering. At varying distances from the descent are four separate alcoves with panels of the mysterious paintings. The best is at the farthest point several miles up-stream, and consists of a gallery of figures along a wall about 150 feet long. 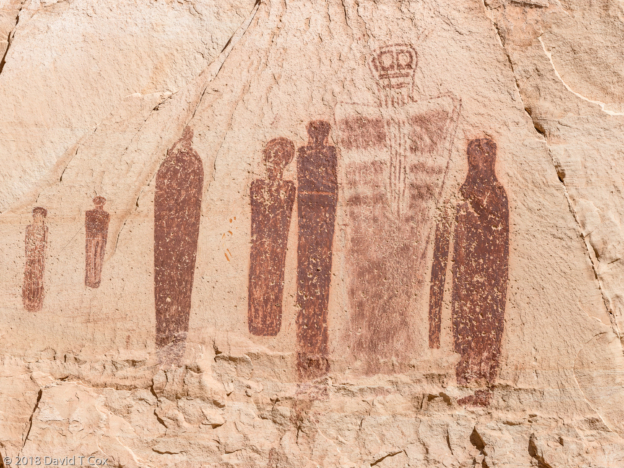 Over 25 of the life-sized figures are spread across the cliff face, many with multihued colored "shrouds" and some with elaborate decoration on the "shrouds." Interspersed among these figures are multiple smaller anthropomorphic figures, some in apparent action poses, and occasional animal figures. At the end of the slog back down the canyon awaits the climb back up the 800 foot cliff, where my mutterings often included colorful words. From Green River I drove to the northeastern corner of Utah for my first visit to Vernal. There I spent a full day in Dinosaur National Monument. The Green River cuts through ancient layers of uplifted earth which contain huge numbers of dinosaur bones. 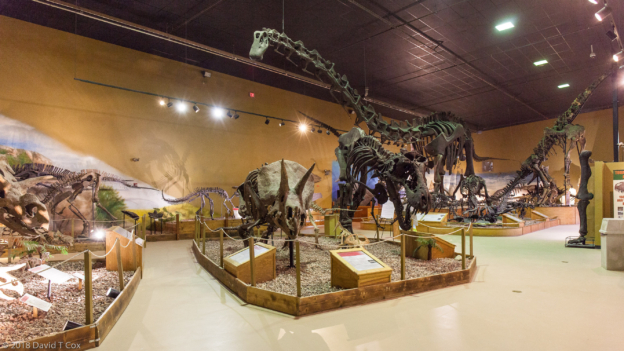 I believe I read that, of all the largest dinosaurs which may be viewed in museums around the world, more complete skeletons came from this location than any other. From about 1910 through the 1950's the giants were excavated. 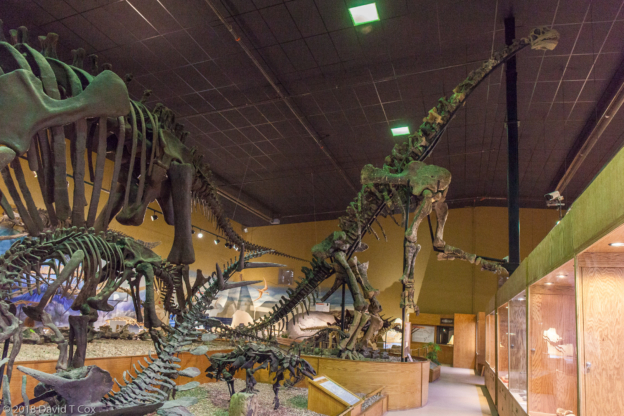 Now the long cliff face, which once was a flat river flood plain, has been exposed showing thousands of remaining animal's petrified skeletons, and a huge building constructed around it, to permanently display to the public the richness of such a natural find. 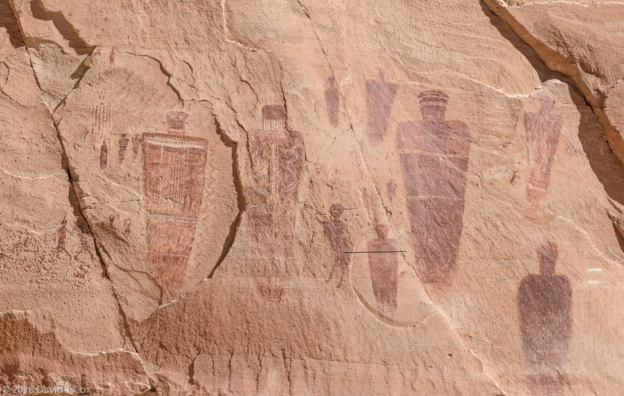 Of equal interest to me were the many Fremont petroglyphs found in the Monument. The Fremont were the northern neighbors of the more prolific Basketmakers in the 4-Corners region, and also produced extremely fine detailed petroglyphs from perhaps 500BC to 1200AD. Here one cliff face contained a number of very large lizards, which is unique, and leads one to speculate as to the meaning. 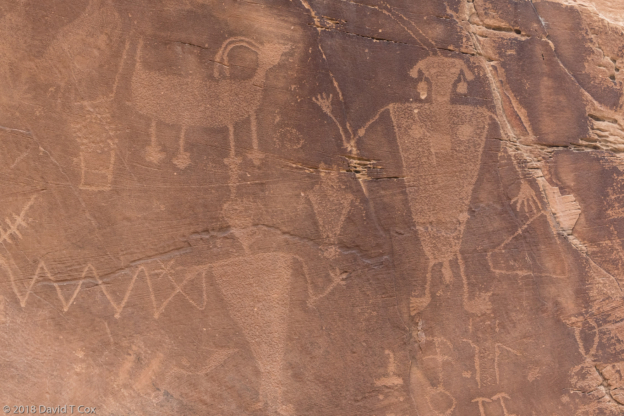 In another canyon just 25 miles from the monument are a several more unique Fremont petroglyph panels, each displaying from 6 to 12 finely detailed and ornately costumed individuals standing side by side facing the viewer. Each individual's attire is different, including different head-dresses, but all have large chest necklaces. Some have speculated that the objects held between the two largest figures in two of the panels are decapitated heads. The first four days I stationed myself in Canyon, named for its proximity to the Grand Canyon of the Yellowstone. The weather did not cooperate for three days, switching sometimes hourly from snow-thunder storms to sleet to pea size hail to sun to rain then back again. My second day the power went out in all of Yellowstone and no one could pump gas for their cars; half of the food sources closed, and the other half tried what they could with natural gas and backup power to make whatever sandwiches etc. they could for hungry people. 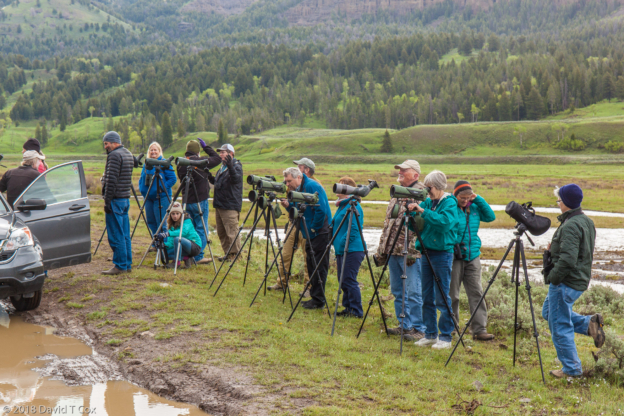 Each day I traveled over the Dunraven Pass and down into Lamar River Valley which usually has the largest population of wildlife. 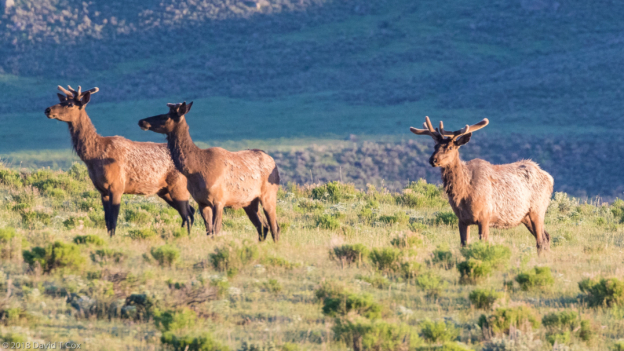 During late spring the wild flowers are in bloom and most of the larger animals have new-born popping into existence. 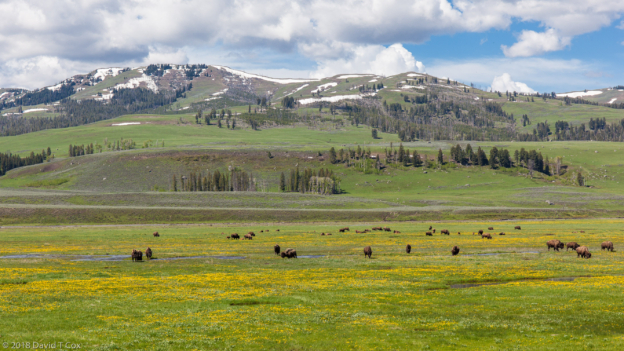 The bison are in relative large herds and spread over the valley, with large numbers of the cinnamon colored babies. 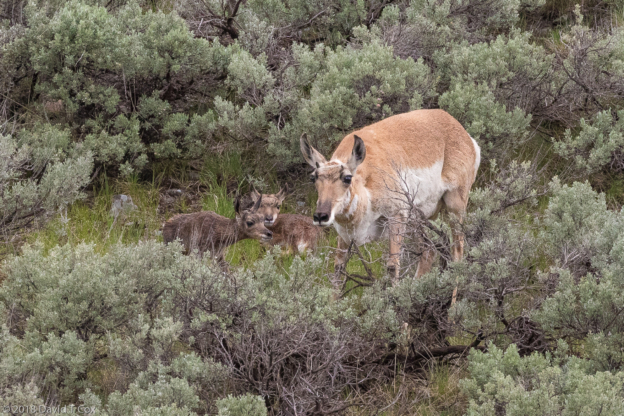 I spent four hours late one rainy morning patiently observing a lone Pronghorn female cleaning, feeding and waiting for her just dropped twins to get strong enough to move. 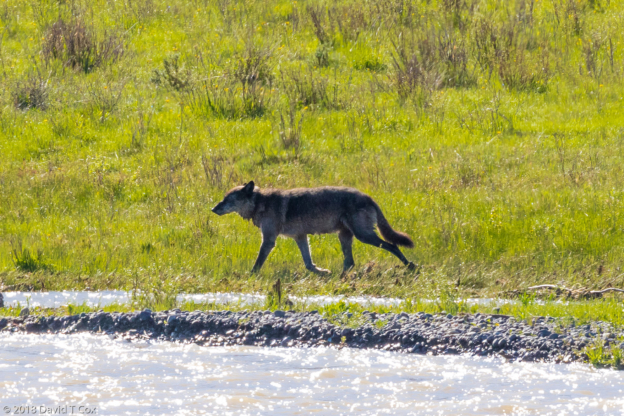 The young took perhaps half an hour to start standing; within two hours they were exploring the surroundings. 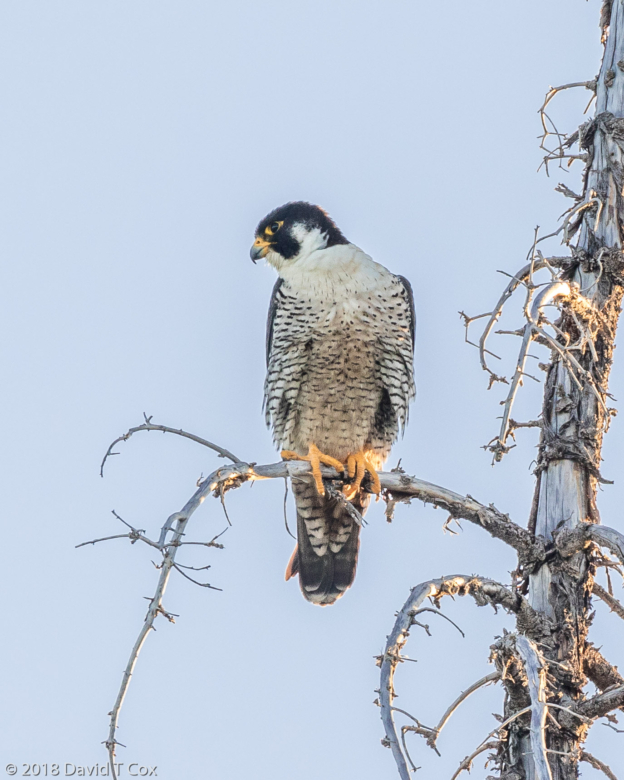 Very surprisingly, and I believe very unusual, the male hung around and even went nose to nose several times with the newborn. 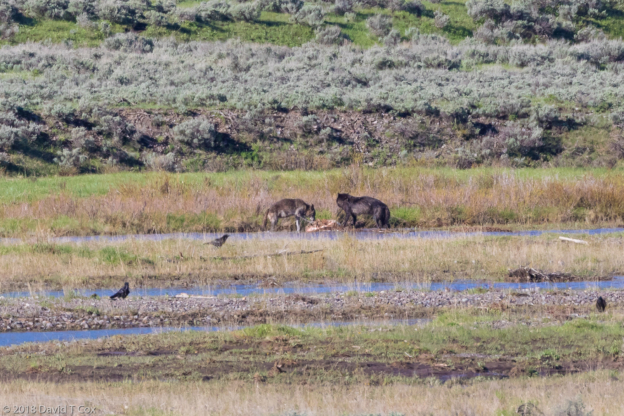 Many of the Black Bears and Grizzlies have twin cubs, which if visible from the roads cause "bear jams." 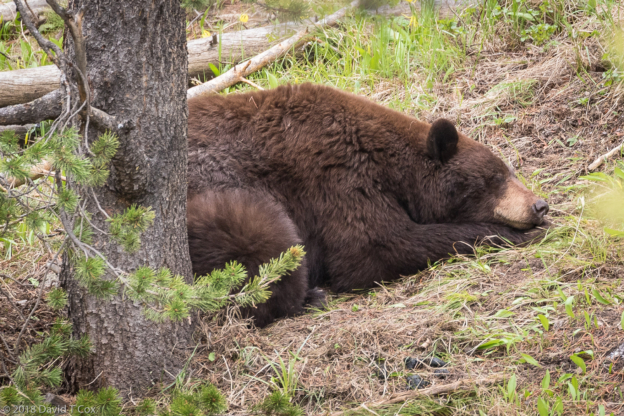 I have seen fleeting views of the cubs, but more commonly find the mama bear at mid-day sleeping at the base of a pine tree, knowing the cubs are hidden somewhere up the tree. On June 2 I relocated to Fishing Bridge Camp where power hookups are available, but the restaurant was closed, so it was necessary to prepare all meals in the trailer. 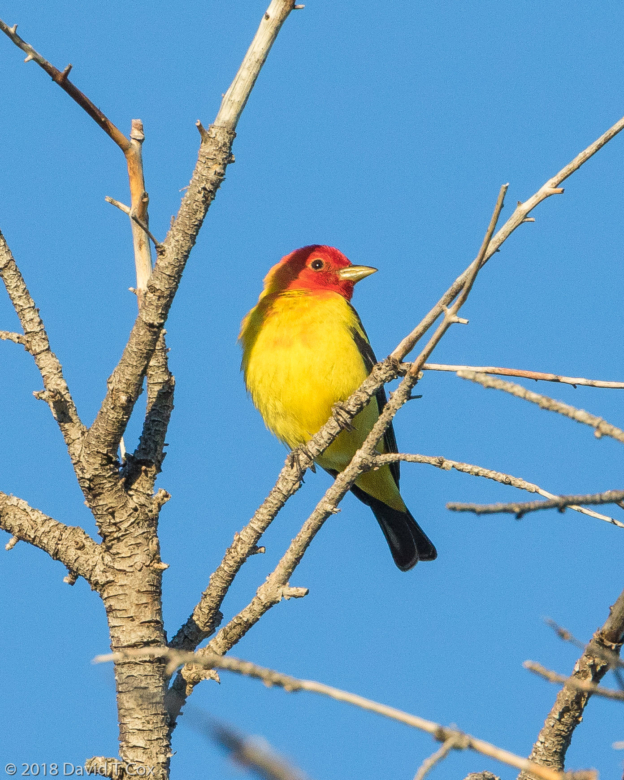 The weather turned nice for four days in a row with blue skies and mid-60s temperature. I spent the days looking for grizzlies but with no luck. 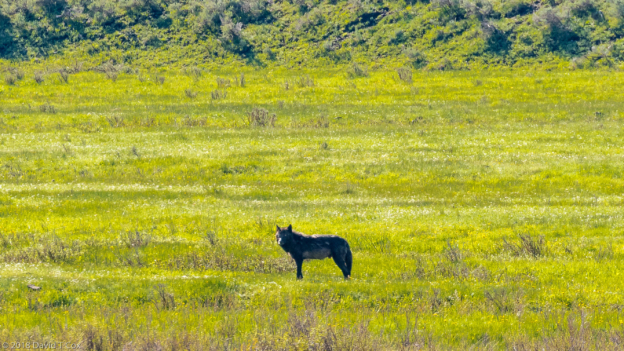 I did spot the Wapiti Wolf Pack members on two different days, but at well over a mile away. 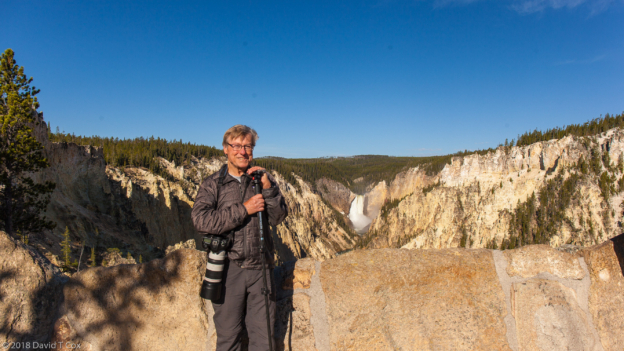 I also put together one massive stitched photo of Lower Falls in the Grand Canyon of the Yellowstone – millions of pictures have been taken of the view from Artist's Point, but I suspect few to none with original resolution of over 350 million pixels. 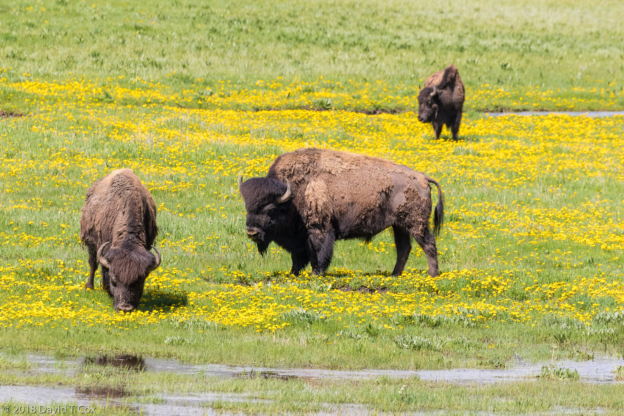 My final morning I got stuck in a "bison jam" (bison created traffic jam), as a large herd moved up Hayden Valley through a number of very narrow spots between the river and cliffs – the bison find the paved roads the preferred means of getting through narrow passes and water locations. 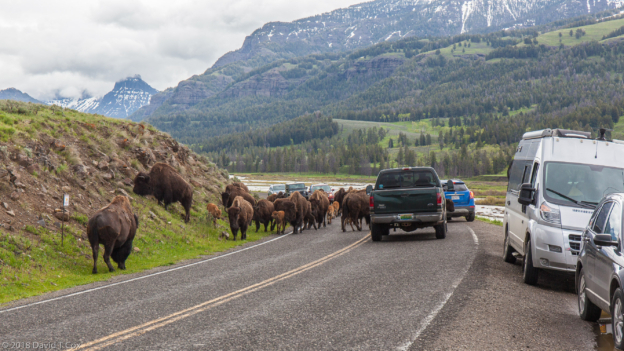 Because the herd is stretched out, only a few start down the road at a time, but before they clear others start, and completely block traffic. I timed the stop at exactly 45 minutes. 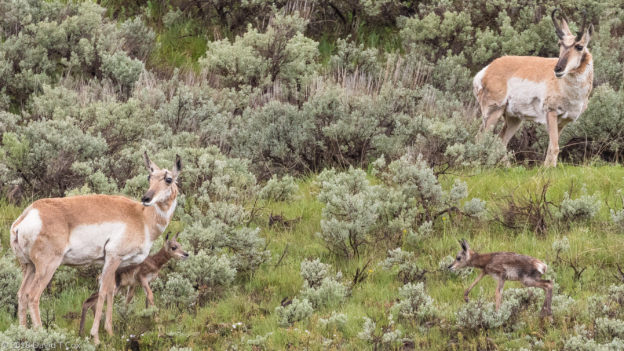 That was probably painless compared to what I witnessed exiting the West Entrance to the Park. 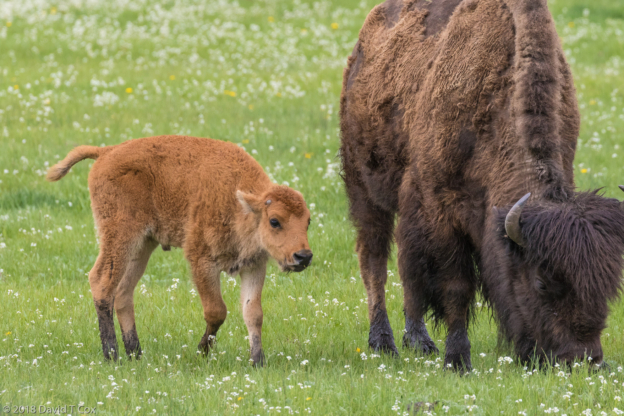 About 12 miles from the entrance, 3 lone male bull bison were slowly making their way up the road into the higher elevations – traffic entering the Park were backed up, though our exit lane was clear. As I read off the mileage, curve after curve, I was stunned to find the entering traffic was completely halted with the jam stretching to well over 3 miles. I estimate well over 500 vehicles were trapped on the winding two lane road with no hope of proceeding for probably hours.